You may be looking for Jethro, a character in Grand Theft Auto 2. Jethro is a character in the Grand Theft Auto series who appears as a minor character in Grand Theft Auto: Vice City (set in 1986) and Grand Theft Auto: San Andreas (set in 1992). He is a mechanic and is usually seen with best friend Dwaine. He is voiced by John Zurhellen, who also voices Jeremy St. Ives in Grand Theft Auto IV, The Lost and Damned and The Ballad of Gay Tony. Jethro, at some point prior to 1986, had become a skilled mechanic working on marine engines along side best friend Dwaine at their boatyard in Viceport, Vice City. The two, seemingly comfortable in Vice City, sell their business to mob boss Tommy Vercetti. The two, prior to 1989, leave Vice City after they could no longer return to the boatyard and settled down in San Andreas. The two attend the '89 San Fierro Love In where they met The Truth, an aging hippie who began selling them drugs from his farm in Leafy Hollow. Jethro had got a job at the Xoomer Gas Station in Easter Basin, working as a mechanic, but is convinced by The Truth to join Carl Johnson at his garage, later being joined there by Dwaine. He continues to appear at Carl's garage, initially seen to be working on a car, telling Carl that two police men have come looking for him, playing cards with Carl and Cesar Vialpando, looking at a car and sitting at a table with Carl. Jethro also informs Carl of the local driving school, suggesting his driving could be improved and later of the illegal street racing scene in San Fierro. 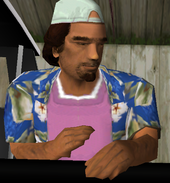 An unused audio file in Grand Theft Auto: Vice City suggested that Jethro and Dwaine were also to appear in The Fastest Boat for Ricardo Diaz. Jethro (left) with Dwaine (right) at the Boatyard in Viceport, Vice City. Dwaine (upper right) with Jethro (lower left) in San Fierro, San Andreas. This page was last modified on 12 May 2014, at 01:17.